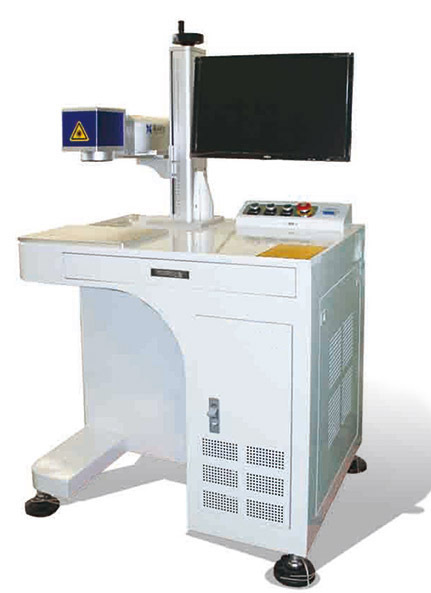 Laser marking machine is applied in marking words, logo, symbol, character and etc on multi-material items. It has advantage of wide adaptability, fast speed and high precision. Fiber laser marking machine is one of the most advanced laser marking equipment in the world nowadays, because the features of stable output power, great optical model, excellent quality of laser beam, fast marking speed and best marking effect and efficiency. Also, it is easy to operate, has no wearing parts, low power consumption. More incomparable advantages like: better and thinner marking lines, capable of being applied into more advanced industries needing higher demand of depth, smoothness and precision, in order to perfectly meet requirements of consecutive working in industries. There are 3 types of fiber laser marking machine: all-in-one type, detached type and Sealed type.Each type has different designed structure and own characteristics for different marking purpose and using environment. Electronics and communication tools, IC chips, computer accessories and electrical appliance, all kinds of precise components, hardware tools, instrument and meter, aerospace devices, jewelry, clocks, gifts, office supplies, trademark signs, sanitary ware, tableware, food, beverages, tobacco and alcohol and many other industries for marking logos, symbols, words and also can be used in production line for mass quantities work. Currently manufacturers of composite insulator are using this laser marker to mark model name and logo on polymeric shed of insulators, which has better effect, higher efficiency and better durability than old method of paint brushing.